Looking for an online slot game that gives you more ways to win than the standard 20-50 paylines? We explain the different Ways to Win slot games available online and how these can help you spin your way to some exciting wins. What are All Ways slots? 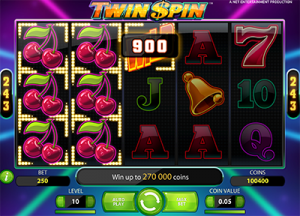 Twin Spin is one of the most popular 243 Ways online slots. In a typical slot game, a certain number of paylines are offered, which means there’s only a specific number of symbol combinations you can line up in order to create a win. In Ways to Win slots (which are also known as All Ways slots or Multi-Ways slots), the number of possible winning combinations increases dramatically. When playing online, slots can offer anywhere from 243, 1024 and 3125 ways to win – that’s hundreds and even thousands of potential winning combinations for each and every spin. Essentially, in a Multi-Ways slot game, pre-determined paylines are no longer necessary, and winning combinations can be formed anywhere across the reels in any direction from right to left in any winning sequence. These games are played over five reels and usually offer multiple bonus features including wild symbols, scatter symbols, free spins, mini-games and gamble features. All Ways slots have become very popular with online players who are attracted by the possibility of landing more frequent wins per spin. A majority of all Multi-Ways slot games come to us from Microgaming, one of the leading developers of online casino software, which you’ll find at several of our recommended Web casinos, including Euro Palace, 32Red and Joe Fortune – depending on your location. When it comes to All Ways online slots, 243 Ways games are by far the most popular and you’ll find many of these available at our recommended casinos. The basic mathematics behind how these games work is fairly simple: 243 Ways games have five reels, with three rows, therefore the number of ways to win is determined by 3 x 3 x 3 x3 x 3 = 243 Ways. 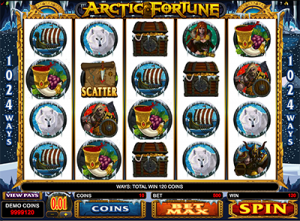 Artic Fortune is a popular 1024 Ways to Win slot by Microgaming – give it a go. Things get a little more interesting in 1024 Ways slots, with an additional row increasing the number of symbols on each row to four. Like 243 Ways slots, the mathematics are the same, simply increased to 4 x 4 x 4 x 4 x 4 = 1024 Ways. Microgaming first released a handful of these 1024 Ways games a couple of years back as a bit of a novelty to attract new players, but seemed to lose interest in the 1024 Ways format pretty quickly as we haven’t seen any new 1024 Ways titles for a while. 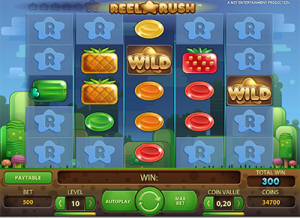 Reel Rush is unique in being one of the few 3125 slots available online. Like 1024 Ways slots, the 3125 Ways format isn’t as popular and you’ll only find a couple of these games available online. Yet again, an additional row is added, bringing the total slot grid to five reels by five rows, or 5 x 5 x 5 x 5 x 5 = 3125 Ways. This is a fairly bold concept that doesn’t seem to be as popular as we might have expected, so the 3125 Ways game selection is very limited. No special skill or strategy is required to play All Ways slot games, as they work just like other video slots. If you’re familiar with playing standard five-reel games, Ways to Win games will be a piece of cake. Sign up for an account at a reliable, safe casino like the ones recommended on our site, make a deposit using a trusted payment method like credit card, web wallet or pre-paid card, and then load the All Ways slot game of your choice. Use the buttons at the bottom of the reels to select the size of your wager – the minimum and maximum bets allowed vary from game to game, starting from just a few cents to hundreds of dollars per spin. In a 243, 1024 or 3125 Ways slot game, winning combinations can appear much more frequently, which means more spins will result in a payout than they would if you were playing a standard three-reel of five-reel slot game. While this is obviously appealing, keep in mind that although wins may be more frequent, they’ll likely be smaller than the amount you could win when playing a standard payline game. Multi-Ways slot games can be a lot of fun and are well worth a try just to see what all the fuss is about, and then you can decide whether this format is right for you or not. Our recommended online casinos allow you to sample Ways to Win slots for free in practice mode, so you can get used to this type of gameplay before committing to any real money wagers. Play the different Ways to Win slots at Euro Palace where new players can get a welcome bonus that includes double your first real money deposit plus 100 free spins.